Unfortunately it’s not going to happen anytime soon — it seems like it's going to rain and be cold for quite some time. But since my yearning for spring is not going to subside anytime soon, I decided to put California in a bowl. 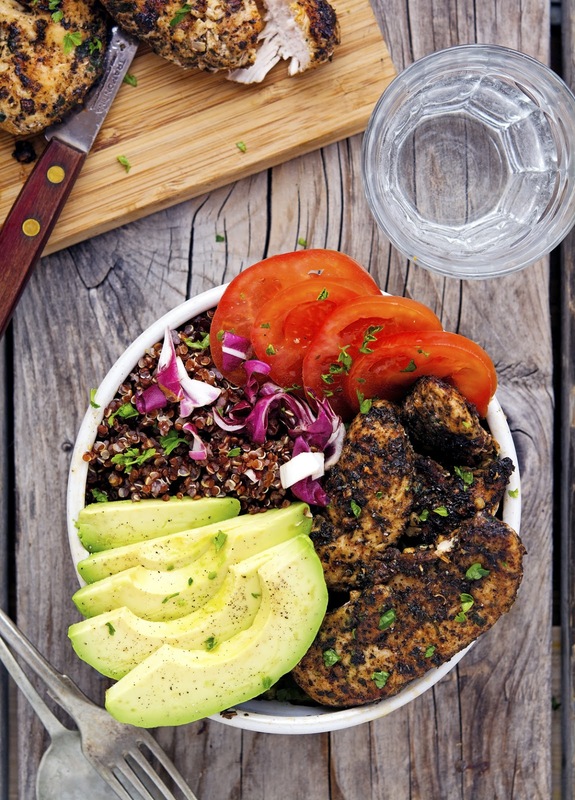 That’s way I created these California Chicken Avocado and Red Quinoa Bowls, to at least put a bit of Cali life on my table. 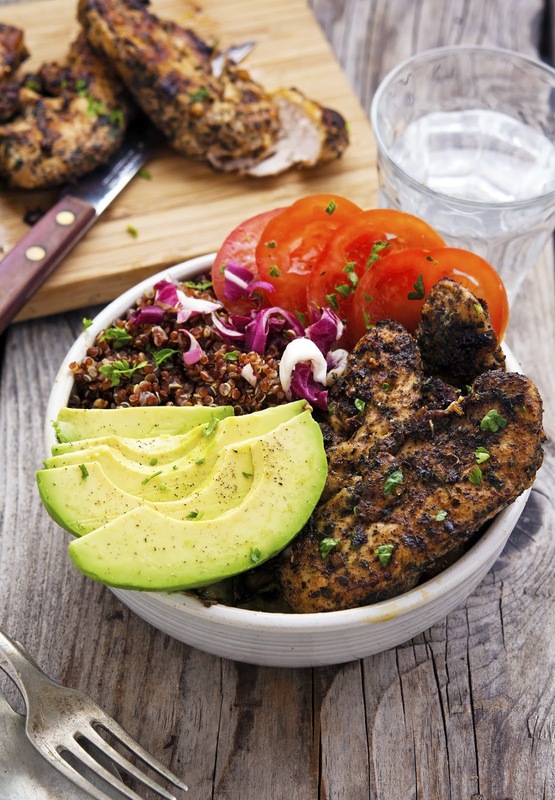 Marinated chicken, avocados, tomatoes, greens, and quinoa in a bowl. I’m possibly more excited about this than I am about chocolate and salt. Possibly. The chicken is tossed in a simple but delicious marinade made with garlic, shallots, paprika, cayenne pepper and a ton of parsley and basil, olive oil, and lime juice. Then it’s grilled until nicely charred. Grilling is my favorite method of cooking chicken, but you might as well roast in the oven or sear it in a pan. These bowls are so delicious and easy to make. I would recommend making the chicken the night or day before so you can throw the bowls together when you want them. And believe me when I say that if I could put California in a bowl this would be pretty close. 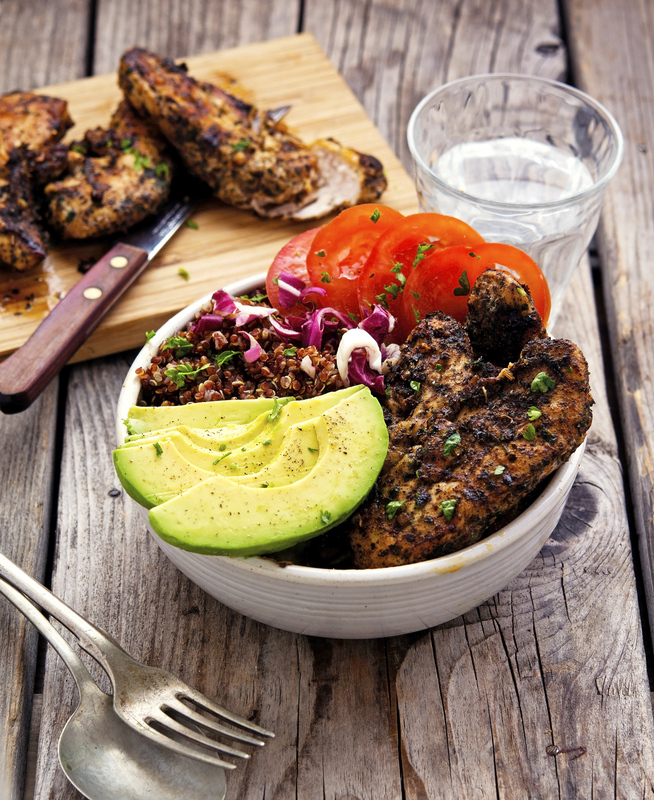 California Chicken Avocado and Red Quinoa Bowls Print this recipe! In a large bowl combine olive oil, garlic, shallot, pepper, cayenne pepper, paprika, parsley, and basil. Add chicken and toss well. Cover and marinate in the refrigerator for at least 30 minutes (marinate overnight for fullest flavor). In the meantime make the quinoa. Place quinoa into a fine-mesh strainer. Rinse thoroughly with cool water for about 2 minutes. Rub and swish the quinoa with your hand while rinsing. Drain. Heat a splash of olive oil in the saucepan over medium-high heat, and add the drained quinoa. Cook, stirring, for about 1 minute, letting the water evaporate. Add 2 cups of water and ¼ teaspoon of salt. Bring to a rolling boil, lower to a simmer (turn heat down to the lowest setting), cover, and cook for 15 minutes. Remove from the heat and let stand for 5 more minutes, covered. Stir in olive oil and pepper. Set aside. and cook until nicely charred and cooked through (about 4 to 5 minutes per side). Transfer to a plate to cool and set aside. To assemble bowls divide the quinoa and greens among 4 bowls or plates. Top each bowl with equal amounts of chicken, avocado, and tomatoes. Drizzle with lemon juice and olive oil and serve! One serving yields 619 calories. 40 grams of fat, 39 grams of carbs, and 32 grams of protein. Need to put this on our meal plan next week. We are finally warming up here, and I am loving being able to grill outdoors again. So simple and so delicious. Cannot wait to try this! It seems you're describing our weather, Mike - rainy, gloomy...like beginning of fall! But spring is inevitably coming so I'm ok to wait a bit. I just need to grab such a hearty bowl you've got here, and I will be ready to wait more (like 3-4 days). Daaaangg, that looks tasty! 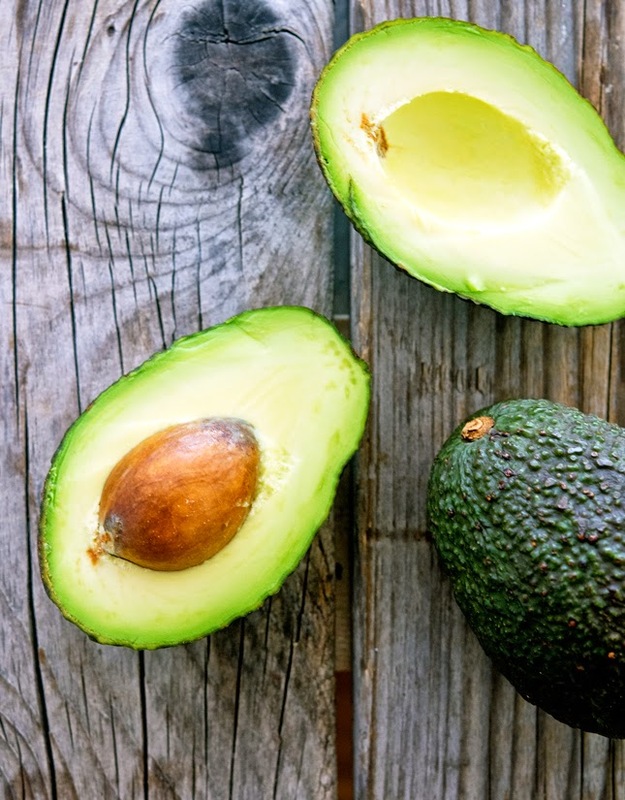 I love avocado and quinoa: they go so great together. Easy meals are always welcome. Hi Mike, it is so ironic, I live in Arizona and I get so tired of the sun, it is almost depressing. Love, love this dish, avocado makes everything amazing. Sugarnuts - Duuude - while the weather on the east coast might be a far cry from ideal, your chicken is seasoned and cooked to perfection! That chicken marinade sounds perfect. And adding avocado to anything makes me want it all the more! Just ordered some quinoa from purebrandsusa.com and can't wait to try out this recipe when my quinoa is delivered! It looks amazing! Had this for lunch today...and dinner yesterday :). I couldn't wait to try it! And man...I was very satisfied! I highly recommend this dish! Yum! The avocado chicken combo is just so dang delicious! I can NEVER EVER get enough! I'm always absolutely desperate for sunshine this time of year too, I guess we'll just have to stick to sunshiny foods like this awesome chicken bowl! I just discovered your blog and made this for dinner tonight. Absolutely delicious and can’t wait to try more of your recipes!